If you are the kind of reader who enjoys a book with big themes to ponder over, all set within an enthralling quest for Good against Evil, then you might like to try this book. Lyra lives in a society where experimental theology is regarded as the true science, and this seems quite natural in a world where everyone's soul is separate and visible. For every individual shares the journey of his life with a daemon, an animal form which stays close and shares all intimate thoughts and which by its very appearance can reflect the most subtle state of mind. Lyra and her daemon Pantalaimon enjoy a carefree existence as an orphan under the haphazard care of Jordan College in Oxford. There she plays with her friend Roger the kitchen boy, running wild in the College grounds, up on the roofs and down in the crypt. But a morbid fear lurks in Lyra's skewed society. Children are disappearing, seduced somehow from the slums, vulnerable children who are unlikely to be missed. No one knows what happens to them for they are never heard of again, taken by the Gobblers. When the Gobblers strike in Oxford their appearance coincides with that of the strangely compelling Mrs Coulter who distracts Lyra from the alarming loss of Roger. 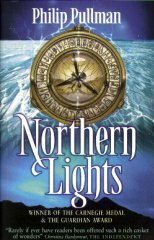 Lyra begins to fear that Mrs Coulter is responsible for the abduction of the children and she determines to uncover the truth behind the Gobblers and what goes on at the Experimental Station in the remote north. There may also be a chance to rescue Roger. In the ensuing quest Lyra discovers that she is perfectly poised in this battle of Good against Evil, being especially significant to both sides by reason of her birth. And the Witches of the North hint at her fulfillment of a prophecy. The basic storyline in this book is simple enough, reminiscent of the Snow Queen where Gerda goes in search of her friend Kay whose heart has been pierced by a shard of mirror and who has fallen under the spell of the evil Queen. But there are some challenging themes to wrestle with. Is the human soul separate from the human body? Does the soul die when the body dies? Can we commit a sin if we do not have a soul? Can we be rescued from the burden of original sin? Don't be alarmed if none of these big questions springs to your mind when you read about Lyra's adventures. This book is very much one of those where it depends on what ears you are listening with. I found myself preoccupied with the underlying theological ideas but you might just as easily find yourself wondering about the possibility of parallel universes or the more down-to-earth business of travel in an arctic wonderland. And what a terrific landscape this book is set in!